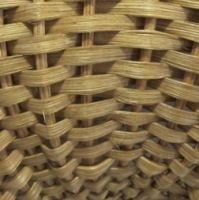 The Association of Michigan Basketmakers was founded in 1981 to develop and perpetuate the art of basketry. AMB membership includes more than 500 individuals from the United States in addition to Canada, Japan, and Russia. AMB members represent a diverse range of experiences and skills. They create basketry from a wide variety of materials including reed, barks, wood splints, cane, waxed linen, beads, and gathered natural materials. Many members gather annually to learn new techniques and to meet old friends at the AMB Annual Convention. Every autumn hundreds of AMB members gather at the Annual Convention. This five-day event brings together basketmakers of every level to share techniques, to marvel at each other's talents, and to promote the art of basketry. The AMB Annual Convention is one of the largest basketmaking gathering in the United States with more than 250 attendees and visitors each year. Although the public is welcome to browse through the exhibit room and to shop with vendors, most other convention activities, including workshops, are limited to registered participants. If you would like registration information and are not a current AMB member, please contact the AMB membership chair. To fulfil the purpose of the AMB to promote interest, appreciation, and knowledge of basketry, Spring Event has changed to become AMB Sponsored Community Events. At the May, 2013, Board Meeting, guidelines for Community Events were adopted. Any recognized guild of the AMB can submit a proposal for a community event. Some of these events might be a workshop for seniors or Scouts, a public exhibit of baskets, a speaker, or a demonstration. The event can be held any time during the year. A proposal form and event guidelines can be obtained from Marlene Cosgrove, the Vice President of Community Affairs. You can also download the Sponsored Event Form and Guidelines. After the form is submitted to her, the AMB board will then review the proposal to determine if it will fund or partially fund the event. The AMB supports the formation of guilds for basket weavers. There are currently thirteen basket guilds in the state of Michigan that have AMB status. For a list of these guilds, see the resources page. Any basket guild that would like to become an AMB guild should contact the Guild Chairperson and read the guidelines. The AMB offers a $100 honorarium to guilds that qualify. Please read the guild guidelines and fill out the form.